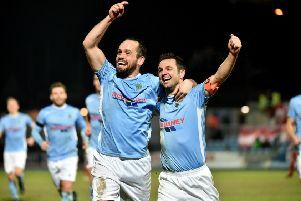 Darren Murray (left) celebrates with the scorer after Sean Mackle's opening goal for Portadown against Ballymena United. Pic by PressEye Ltd.
Portadown took another step forward with a point and encouraging performance away to Ballymena United on Saturday. Sean Mackle broke the deadlock for the Ports by stooping low to head home a Gary Twigg cross, following sharp play by the forward to move past Ballymena goalkeeper Dwayne Nelson and pick out the run of his team-mate into the penalty area. Allan Jenkins rewarded Ballymena for increased pressure with an equaliser - but the point on the road handed Portadown another positive following the previous weekend’s 3-2 victory against Carrick Rangers that stopped the rot after six successive defeats. BALLYMENA UNITED: Nelson, Ervin, Taylor, Rodger, McBride, T Kane, Jenkins, Thompson, Cushley, Tipton, Shevlin (sub Magennis 66). Subs (not used): E Kane, Ruddy, Ferguson, McVey. PORTADOWN: Miskelly, Ramsey, Oman, O’Hara, Redman, Casement (sub Mouncey 82), Gault, Garrett, Mackle, Murray (sub McAllister 89), Twigg. Subs (not used): Brennan, Parker, Richardson.